Beckett was a writer fascinated by form. His plays and novels continually redefined literary and performance models in his attempts to ‘accommodate the mess’ of man’s place in the modern world. It is the writer’s commitment to form which has governed the Beckett Estate to guard so fiercely the staging instructions of his plays; one side effect of this has been that some of the more interesting explorations of his work on stage in recent years have worked with texts from his novels that aren’t so stringently defended. Ireland’s Gare St Lazare Players have established a reputation at the forefront of these theatrical reanimations of Beckett’s novels and prose, and in Here All Night their director Judy Hegarty Lovett is commissioned by the Beckett Project Paris (which exists to promote the writer’s legacy through artist-led projects inspired by Beckett’s work) to bring together a new ensemble taking this experimentation itself into a new form: music. This is a formally experimental work in four acts. Fragments of the novels are performed by Conor Lovett whilst solo soprano Melanie Pappenheim, accompanied by a trio chorus of female voice, cello, violin, and piano, performs an original score inspired by the music in Beckett’s work and composed by Paul Clarke. The music feels minimalist in aesthetic and mirrors the folding and re-folding patterns of Beckett’s texts. The artistry in this collected team is powerful: Pappenheim’s folkish soprano is stunningly fragile. Conor Lovett has a remarkable affinity to the turns and dogged playfulness of Beckett’s prose. His performance makes the text feel like real lines of thought, stripping out the sense of artificiality and over-thinking that can sometimes get in between the readers/audience and the insight, wit and comedy in the writing. 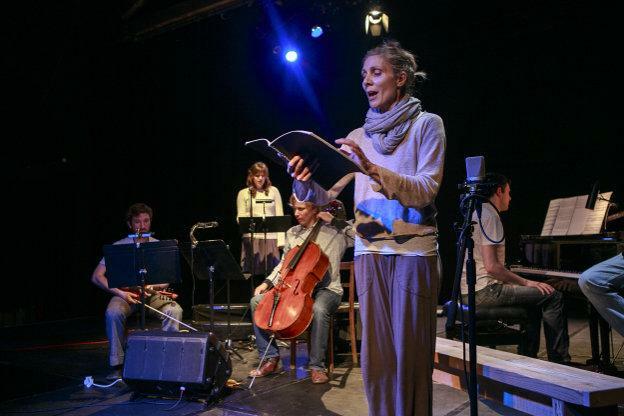 Throughout, the balance of the folkish and high art – in the tension between Caoimhín Ó Raghallaigh’s relaxed, virtuosic fiddling and John Paul Gandy’s exceptionally detailed grand piano noodlings – picks up on similar contrasts inherent in Beckett’s writing between the high and the low – the philosopher and the clown. You feel throughout that you’re being treated to an extraordinarily rich meal: the ensemble are clearly artists at the top of their game and the quality of performance in both music and theatre is exhilarating. There are obvious affinities between Beckett’s writing and music: his almost mathematical approach to staging and his obsession with controlling cadences of voice have often led to comparisons with musical compositions, Beckett acting more as composer and conductor than writer and director. Yet for all this I couldn’t quite discern the ‘why’ in the piece’s construction. It’s absolutely in the spirit of Beckett’s own approach to art-making to experiment with melding together languages of diverse forms in an attempt to fully express an idea. But as the company’s precise cadences animated words from his world, I found myself feeling alienated from the journey of this combination – what was the arc these four acts were tracking and what was the idea these exquisite fragments were attempting to express? To me, all of the pieces were elegant and beautiful in their parts, but never quite coalesced to elucidate the ‘mess’.